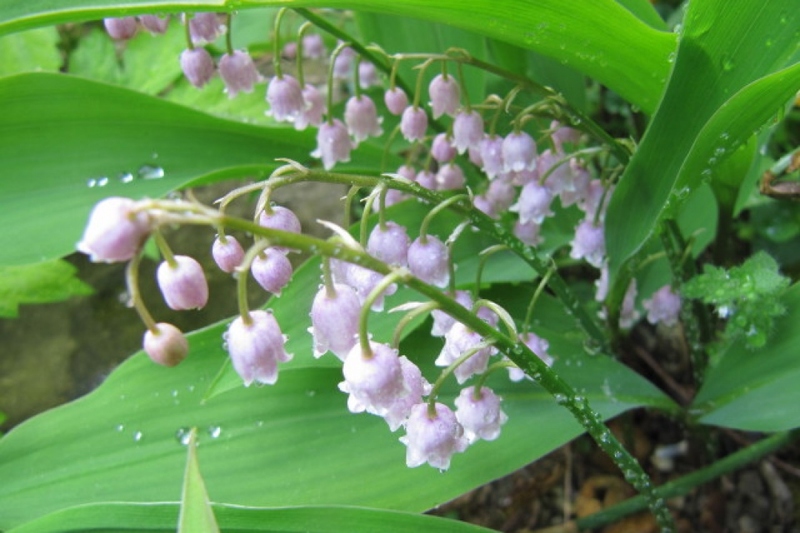 Pink lily Of The Valley (Convallaria majalis 'Rosea'): growing, planting, caring. A Lilly of the valley, only pink. Full description for Convallaria majalis 'Rosea' not yet available. Lily of the valley likes cool undergrowth! You can plant it in a pot or even with exposed roots outdoors, but it might come to please you eventually indoors. If outside, choose a semi-shaded to shaded location, in fertile, cool soil rich in humus. Don't bury the roots too deeply, which will them be impenetrable to water, so arrange them horizontally, letting the buds remain higher. Finish with a good watering – that's it! If indoors, you may repot the rhizomes in autumn and keep them for a while in a dark place so they can develop a new system of stems. When the new petals appear, place them in soft light and remember to water regularly — Groww will remind you! In any case, don't get the leaves get too wet, favourable conditions for fungus growth. If you plant outside in autumn, there won't be a lack of moisture in the soil, so only water in case of spring dryness during the first year and summer dryness from this point on. If you've planted after winter, keep an eye out for watering during the first couple of months. Indoors, water at least once a week. A light layer of mulch over a well-drained soil will limit evaporation and much of the need for watering. Dead leaves and small broken branches will do perfectly! Mulch out in November, and again if necessary in April-May. 3-4 cm of mulch should be enough. You may also divide the rhizomes in October –and go ahead with a new planting! Lily of the valley, if installed in a suitable location, will not deal with much competition. Watch for and remove any young tree shoots or bushes that may succeed in sneaking in! Lily of the valley, in packed soil — caused by heavy vehicle tracks or rain on bare earth — worries about grey rot (botrytis). In this case, move it to a more fertile growing location. In the long term, good mulch and the work of earthworms will also help to loosen damaged soil. Lily of the valley isn't particularly demanding of organic material, but you can still give it a little help in autumn by spreading a bit of compost and covering it with mulch. This will also put the earthworms to work!